1_Resources includes all Excel-files, settings files and other resources (eg. images, pictures, CSV-files, …) to be used within the load-script. In 3_DataModell I save my QlikView-file generating the datamodell, putting all QVD-files together to a nice datamodell. In 4_Application the final result of my application is located, just loading the data modell with a BINARY LOAD and adding the user-interface to the available data. This structure does only work, if you have relative paths enabled. If doing so you can easily copy the development solution to the production folder or even to the production-system on another server. 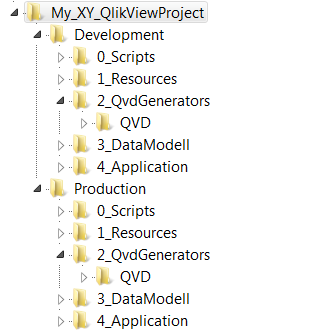 How do you structure your QlikView projects? I am interested in your personal way of organizing the projects. Please use the comment functionality below to post your ideas.